It starts with a boat that is perched about 20 feet up in a tree. Ellis (Tye Sheridan from Tree of Life) and his buddy Neckbone (Jacob Lofland in his debut) find it and claim it as their own. Ellis is the sensitive type with a strong right cross, and Neckbone is actually the smart one. Unfortunately Mud (Matthew McConaughey) has taken up residence in the boat and makes a deal with the 14-year-old boys for their help. 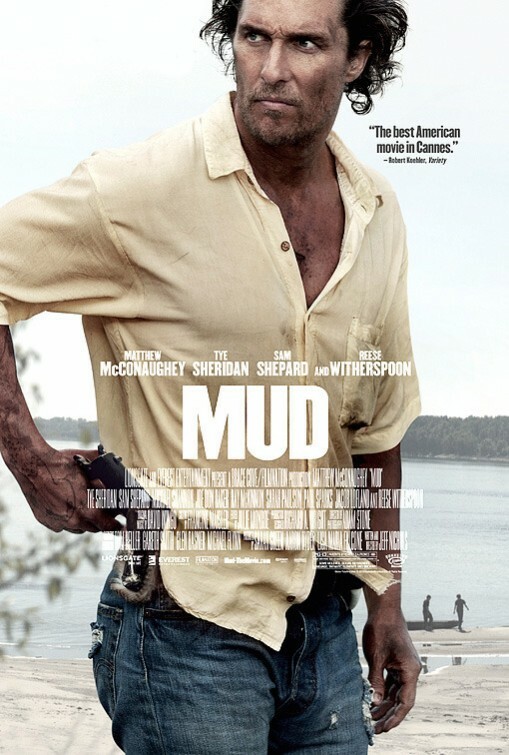 But this movie is not about Mud, not really. It’s about these boys, and Ellis in particular. It’s a coming of age story and what men will do for women. These boys grow up fast along the river and are quick to prove themselves to Mud, who is on the lam and is waiting to link up with his love Juniper (Reese Witherspoon of Legally Blonde). She loves him and does not know what to think about him. But these boys see a man in trouble, and they are the men who can help unite him with his true love. There are some great performances here, from McConaughey and the two boys, who are absolute standouts. Sam Shepard shines as Tom Blankenship, the guy who raised Mud and sees him as a train wreck. He does not know whether to help or run in the other direction. Nichols brought the Arkansas riverbank into the theater, as nothing was shot on a sound stage. The characters had depth, without a hint of cliché. Coming of age stories like this that don’t stumble are rare, and I felt these boys grow and struggle with grown-up decisions. The movie was a little long, but we are not used to movies like this where story and character are important. I am sure the explosions in the theater next to me would have made it feel like a roller coaster ride. I enjoyed my ride down the river, and I now I understand what Ellis’s dad meant when he said, “You can’t trust a woman to love you.” I give this move 4 stars out of 5, and I trust you can get your boat out of the tree and enjoy a cruise down the “Mud” river.